Big congratulations to Jo who has been having Driving Lessons in Torquay and overcame her nerves and passed her Driving Test first time with 6 minors. Jo said “I’m glad I had Rob for my Driving Lessons, he is polite, patient, is a nice person and easy to feel relaxed with. So happy I passed first time …. thank you Rob ?”. Rob who works for The Driving School sw was over the moon for Jo and wishes her safe driving for the future. 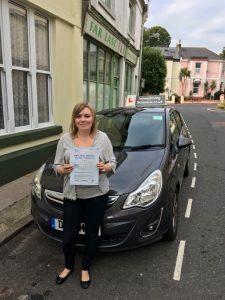 For Driving Lessons contact www.thedrivingschoolsw.co.uk or call 01803 640607 we cover Torquay, Paignton, Brixham, Newton Abbot and all surrounding areas.